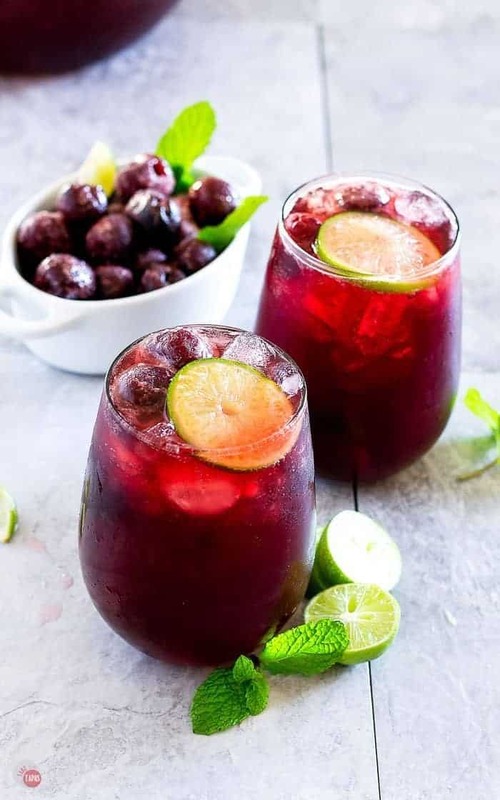 Summer is right around the corner and if you are looking for a new cocktail to enjoy while you are by the pool, check out this cherry limeade punch! Tart cherry juice, sweet and sour limeade, and vanilla cream soda hit all the right notes. Add some vodka for a little adulting! Looking for a new Party Punch? As the temperature starts to climb, so does my need for something cool and refreshing to put in my glass! 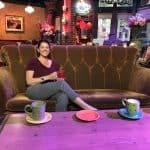 Do you know of any good summer drinks? I have a few in mind, like my Wimade and my Blackberry Coconut Splash, but what if you need a something bigger? A baby shower punch or brunch punch recipe for a crowd? This Cherry Limeade Punch is just the drink you are looking for! It reminds me of all the cherry vanilla sodas I drank as a kid, you know the ones with vanilla syrup and that bright red grenadine in them. I have brought all those flavors back, with the addition of some lime and cream soda for bubbles and made it into a cocktail that you will certainly add to your list of summer punch recipes! Just take me to the Cherry Vanilla Limeade Punch Recipe Already! 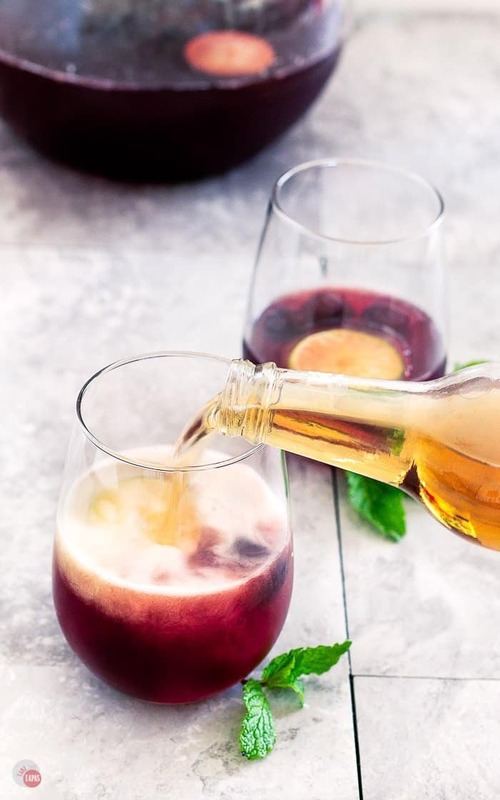 If you’d rather skip my (very helpful, I think) tips and tricks, essential cooking info, and similar recipe ideas – and get straight to this delicious easy Cherry Vanilla Punch recipe – simply scroll to the bottom of the page where you can find the printable recipe card. You might recall that I love cherry limeade. I mean, I drink it all the time and make cocktails out of it all the time. My favorite being my cherry amaretto limeade. It is also a favorite of yours because it is consistently one of the top 5 recipes on the blog. Making cherry limeade from scratch is easy! The cherry limeade recipe contains just a few ingredients, or a few more if you like to make your limeade from scratch. If you want to make it from scratch check out the Wimade post for a limeade recipe made with honey instead of refined sugar. Start with your limeade, whether homemade or premixed, and add your cherry juice. I like a 1:5 ratio or 1 part cherry juice to 5 parts limeade but feel free to play around with it until it is how you like it. I would also recommend using pure cherry juice if you can find it and not a cherry/grape juice mix. Definitely not grenadine in place of cherry juice. Way too sweet! What’s the Party Punch Recipe? The cherry limeade punch comes together with limeade and cherry juice added to a pitcher. When I am ready to serve it, add the best damn cream soda you can find. I prefer IBC cream soda because I think it has the cleanest vanilla flavor but feel free to use what you love most. After you have the cherry vanilla limeade ready, you can serve it as is or make it an adult beverage by adding some vodka! You can substitute vanilla vodka and use sparkling water if you are not a fan of cream soda, just be sure to test the vanilla vodka in a separate glass to make sure it isn’t too strong. 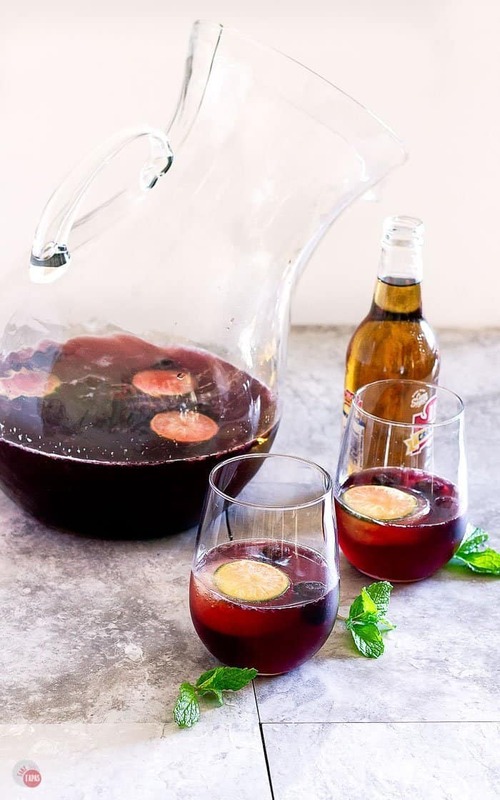 Serve the punch in a large pitcher or add the pretty garnish ice cubes in individual glasses and pour each one separately. It’s fun to add the cherry limeade punch and let your guests add their own cream soda so they see the bubbles! They really enhance the flavor. Q: What do I use if I can’t find pure cherry juice? A: Do not use grenadine 🙁 I would find an unsweetened cherry/pomegranate juice mix if possible. I would use a cherry/grape mix as a last resort. Q: What if I can’t find cream soda? A: You can use a vanilla syrup (not a 1:1 substitution though!) I would add sparkling water and then slowly add vanilla syrup until the flavor is to your liking. Q: Can this be made ahead of time? A: Yes, you can mix and then store in the fridge. Add the cream soda, vodka, and ice cubes at the time you serve the punch. 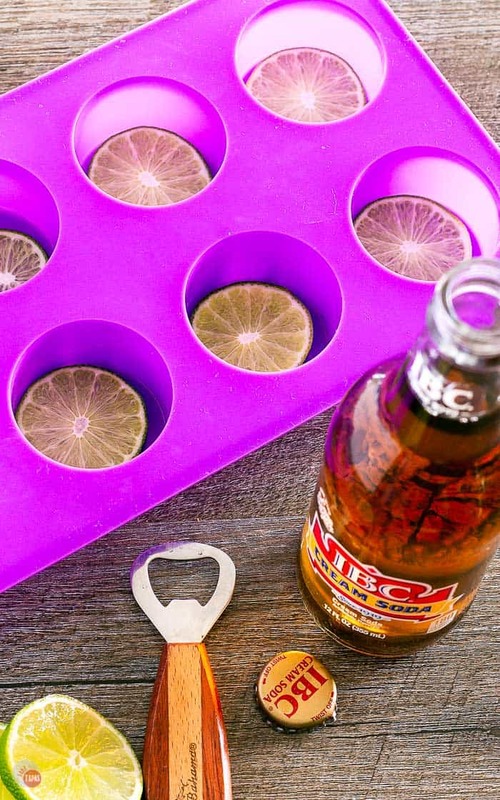 Q: What if I can’t find silicone molds to make the ice cubes? A: Feel free to use a muffin pan and then dip the bottom in warm water to free the ice cubes. All the fun flavors of cherry vanilla and limeade in a fun cocktail or large batch summer punch. Get ready for a fun and refreshing summer! 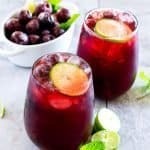 Other great Summer Punch recipes to try! 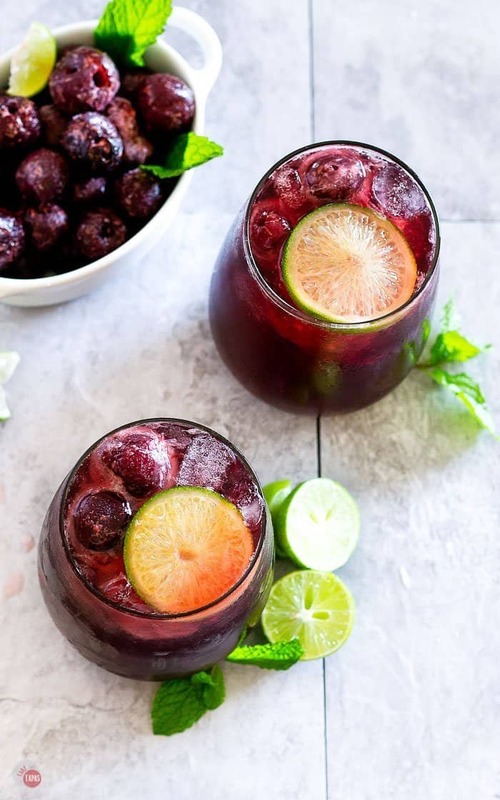 If you love this Cherry Limeade Punch Recipe as much as I do, please write a five-star review in the comment section below (or on Pinterest with the “tried it” button – you can now add pictures into reviews, too! ), and be sure to help me share on facebook! Slice your limes and add one slice to each well of the mold/muffin pan. Add cream soda to fill up. 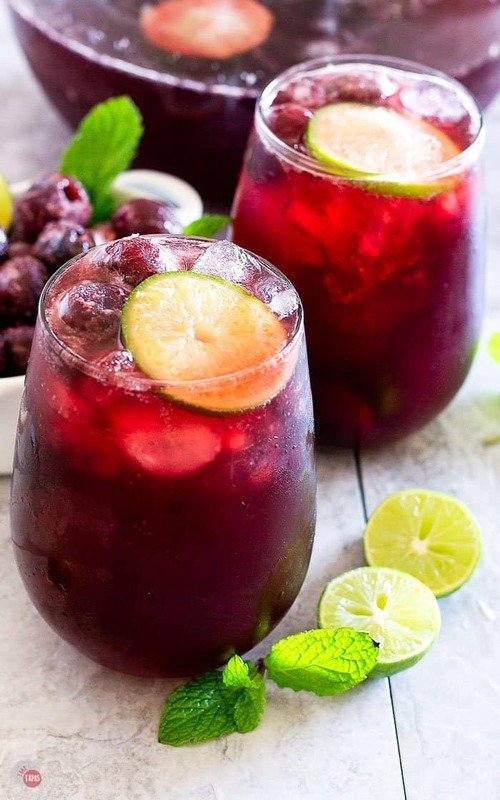 In a pitcher, add the limeade and cherry juice. When ready to serve add vodka and stir. Add cream soda and give a gently stir. Add garnish ice cubes and serve! « Pineapple Cucumber Rum Punch – Fresh Spring Punch for Brunch! Hi there Jennifer! This cherry limeade punch is really going to hit the spot over the summer. We always have frozen cherries around. We love your idea for ice cubes. Great idea to keep your drink cold and refreshing by the pool. Just pinned to all of our favorite boards.